Hello and I am sorry. Technology cannot be trusted and the last two posts were not supossed to be there for the whole weekend. But that's where they ended up( I will explain later) and I want to thank you for your funny comments. I want to also warn you that this post will be very long and very photo heavy, make yourself comfy and ask a loved one to make you a nice cuppa. You will thank me as you read on but make sure you won't be spilling it over the screen when you come to read a particular piece about my unbelievable experience at Convention. I have returned form our very first European StampinUp! Convention in Frankfurt and WOW!! What a weekend! I cried and laughed and hugged and cheered and talked until I lost my voice and I loved meeting so many happy and wonderful people that share their excitement about this wonderful company. I met german demos and french demos and they were all wonderful, we were made very welcome by our german hosts, I met the Monacco trip achievers and I am wishing my life away untill June when we can meet again. 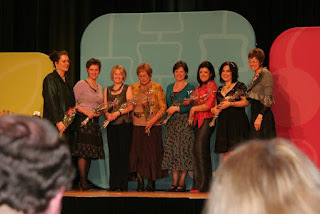 The highlight however was the Awards night. It was truly amazing and I was honoured and humbled to have been awarded **Demonstartor of the Year* for the whole of the UK. This is of course a wonderful achievement and it was the result of a lot of hard work over this last year but I loved every minute of it so thank YOU my loyal customers and my wonderful team members for choosing me as your demonstrator and your team leader, I will work double hard this next year to continue to inspire, lead you and serve you . As nice as taking the top spot was I have to tell you that I was even more excited to cheer my wonderful team, there were 6 of us making top 25!!!! 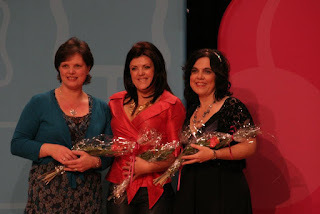 We had Linda Lloyd ranking at number 9, Rebecca Prideaux number 16, Sally Hodder was number 18 and the lovely Tricia Ablett number 20. Just amazing I was beaming with pride that night I can tell you. And what could have topped me getting first place? One of my Passionettes coming second!! and lo and behold my wonderful Yorkshire lass Jules did just that, you should have hear the cheers in the room she is so loved by everyone, a real sweetheart. The next photo of us together on stage shows just how happy I was for her ( thank you JO for your wonderful pictures), click on the pictures to see them bigger. The wonderful and ever so talented Jenni Moors came first, I came second and my Julie came third( I was on cloud nine by this point). It did all get a bit too much at one point, and yes my mascara ended up all over. And then they announced their top 3 Demonstrators of the Year. Now before I leave I have a very funny story to share with you. 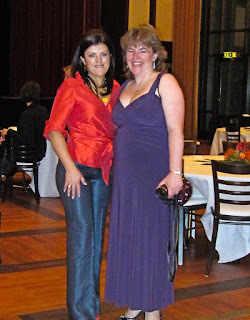 You probably noticed my beautiful outfit (well I thought it was), here I am with the gorgeous Zoe my roomie. She had an amazing night herself, she found out she ranked at number 22 a lovely surprise, and I was so happy to be able to share it with her. **I couldn't find any plasters but I have found this...........holding up in the air for me to catch a good glimpse of was...... a SANITARY TOWEL!!!!!!!!!!!!!!!!!!!! I looked at it in disbelief but very quickly realised that this was my only viable option at the time so we got a pair of SU snips (we had the bloomin snips but no glue can you believe it? ), cut the wings off, chopped the pad in half and secured it to my pits. 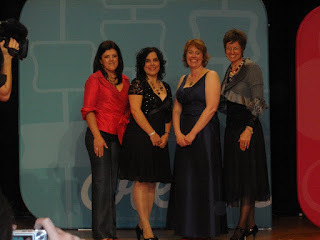 I am so pleased to report that they worked just fine and I felt confident the whole night hugging Shelli and the other achievers, no one suspected a thing but can you just imagine if one would have dropped off.......while I took to the stage. Congratulations!!! So well deserved! I'm really happy for you! Wow Monica! What an experience! Congratulations to you and your wonderful team! Great to read your summary of the event, I too am ready to write something but worried about seeming like I'm boasting! It was fantastic to meet you, well done and roll on Monaco! OOoops, forgot to say I laughed out loud when I read about your sweaty problem, who'd have thought it! LMAO ... I love your story at the end! Big congrats Monica to you and all the other lovely ladies. You all deserve it. And I can only imagine how hard you've worked this year. It's a pleasure being on your team. you must be over the moon - is it true you are now called "Tenna Pits" how funny i am sitting here laughing and now need to rush to loo you are so funny!! Wow Monica ..... an absolute amazing achievement for you all. Well done and may you continue to do so well. Oh Honey Well Done! you thoroughly deserve it. Oh I did laugh about the sanetary towels. Fancy not having any glue! Only You could do this. oh Monica. You do make me giggle.. lol.. ST's under the AP's indeed!!! lol. .
glad you had a great time, and although I probably don't contribute to your team as much as others, I'm still so proud to be part of it. Oh Monica I am sat here crying with laughter - you are sooo funny. And very brave to share your story with us - but that is what makes you - you! I was so pleased to hear about your (& your teams) achievements, All your hard work and enthusiasm has paid off, very well deserved. Here's to being at the next one. Roflol omg Monica my sides are hurting way to go girl. Firstly ccan i say no one would ever think yu were boasting as we know how hard you work with SU. and secondly huge huge congratulations honey and very well deserved. I'm so happy to met you... You're so nice and dynamic. I really appreciate yourself and your creations. Thanks for sharing your experiences with us, I'm so thrilled for you & your team, you're a wonderful woman and an amazing inspiration to us all & I truly appreciate the support & advice you have given to me on ILWS (and the phone of course). Huge congrats on all your awards, and I love your story with the ever resourceful Zoe! Congratulations! Lokk at may blog today. I love your swap! I hope I can see you next year in London! WELL DONE! That is fabulous news and I am very pleased for you (and delighted you are my demo). LOL at the sanitary towel! As the story was progressing I thought you were going to put breast pads! Congratulations on your achievement......your story really made me laught re;arm0pits.....and of course I just love your blog. Congratulations Monica. I am chuffed to bits that your hard work has been recognised by Stampin Up. It is definitely well deserved. Congratulations to You and your Passionettes, such well deserved awards. I haven't had the pleasure of meeting You yet but fingers crossed one day. Well done to you and your team Fantastic achievements and it has inspired me to knock me socks off and join you next year!! congrats on all your successes Monica - very well done. Your story made me laugh. Firstly SO MANY CONGRATULATIONS and I am glad to be a tiny part of your downline. Well done Monica! Secondly - what are you like with the armpits/sanitary towel thing? ROFL - such a funny story. OMG, you're wild! Hope your blouse wasn't ruined as it's gorgeous. Many many congratulations to you and your team for all the awards. Well done for all your hard work. Congratulations Monica on such a fantastic year. Enjoy Monaco. And now the whole world knows!!!! HAHAHAAHA.. Thats too funny! Congrats my sweet, you've done so well and it was such a please to meet you. Your story was hilarious and you're very brave to share that with us all. I love anyone who can laugh at themselves. 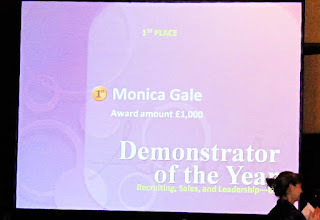 such fantastic news Monica - congratulations on your well deserved success. and i laughed so much at the last part i nearly cried!! OMG Monica... sanitary towels! That's so funny... Congratulations on ALL of your awards.. you work so hard, you deserve every one of them. Huge congratulations 'mummy mon' !!!! I'm so very very proud to be a passionette & you certainly deserve all the recognition & awards you got at convention! No. 1 Demo is quite an achievment and took a great deal of work. You deserve it. I love your outfit you wore at the awards ceremony; you look very elegant. Monica - congratulations to you and your team. Well done. I am crying with laughter at your story. Ingenuity at its best ! CONGRATULATIONS on your many well deserved awards Monica! You are a lovely person and after all your hard work it really is a wonderful recognition for you!!!! PMSL at your story and thinking if they had come loose.. but great thinking as well. Hi Monica - me again. I have left something for you on my blog. Congratulations!!! you make me laugh. well done you deserved all your awards, your cards are so amazing , videos so helpful. Congratulations Monica - you deserve all those accolades. Perhaps you should patent your 'Underarm Absorbers' and sell them to Coast - hee hee ! A great big Congratulations to a well deserved honor! Loved your funny story-we women are ever so resourceful are we not???? Necessity is the mother of invention - maybe you could add the 'new' item to your sales pitch! WELL DONE on your success - well deserved. OMG that's brilliant, and so blummin' honest too. Well done on all your awards and your team too, shame there wasn't an award for most ingenious creation!!! !